CAN BANK INVESTORS GET SOME SUGAR? Maybe this is what the presidential campaign slogan stood for when they suggested things were better in the past. I can say for sure that the music was great back then. One week, Sugar, Sugar by The Archies was number one on the charts. Two weeks later, it was I Can’t Get Next to You by the Temptations. Those songs ruled the airwaves in October 1969, which is also the last time the weekly initial jobless claims came in under 200,000. The last time, until the most recent week, saw initial jobless claims dip to 196,000. Yesterday was the proverbial calm before the storm. Major indices were barely unchanged at the closing bell, but it’s still evident the market wants to rally higher. It’s clear as we enter earnings season, companies that ‘miss or offer’ subpar guidance will see their underlying share price crushed. 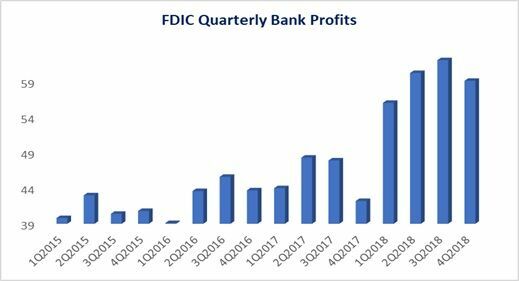 Bank profits were stagnant for a few years until the Trump Tax cut sent them soaring - along with CEO pay, much to the chagrin of several progressive politicians looking for scapegoats to be the face of the capitalism failure in making everyone rich. The alternative is everyone will be poor, but we’ll all be equal. Ironically, if any group of folks should be angry with the banks, it should be shareholders. Shareholders are down on most of the big names from the start of trading 2018 when all the mavens on Wall Street said these names were no-brainers. All eyes have been on JPMorgan Chase (JPM), which has seen mixed reactions to mixed results going back to January of last year. The stock has missed; it was higher one week later, and it has beaten the consensus. The stock was lower one week later. The reaction is strictly a result of management’s guidance. Buckle up, boys and girls, because it was a lot easier for bank CEOs to answer questions from elected officials than satisfying the investors looking for greatness. There are no changes; however, we got aggressive on Constellation Brands (STZ) after management dumped a lot of its lagging wine business. If you have any questions, contact your account representative or email research@wstreet.com. Boeing (BA) announced after the close it has flown 96 test flights with its 737 Max software fix and plan further tests. Meanwhile, Southwest has grounded the plane until August. Disney (DIS) streaming service pricing is substantially lower than anticipated. Perhaps even bigger news for investors is Bob Iger is staying with the firm through 2021. Chevron is acquiring Anadarko for $33.00 billion in cash and shares. This gives Chevron greater access to the Permian Basin and deep-water assets in the Gulf of Mexico. JP Morgan (JPM) posted record results that beat the street and signal the company is firing on all cylinders. Consumer lending surged profits +19% to $3.96 billion. This is going to be a hot deal promoted as the Amazon of mobility, but it will have risk. Here are some outlined by management. Are any illegals in the USA receiving unemployment? Any idea how this plays in Calif ? Given that nasty states recent ruling on 'independent contractors', this could be a problem in a Large market ?? ?